It is that holiday when Christians around the world are supposed to find joy in celebrating the birth of our Lord and Savior, Jesus Christ. And, most do without blinking an eye. But there are some who cringe at the thought of this holiday coming around. It is not for lack of love for Jesus, nor for lack of passion for celebrating his birth. No, it is because they are believing something that is or is not true about the origins of the holiday, or a religious spirit was passed onto them somehow. It could also be a combination of both. 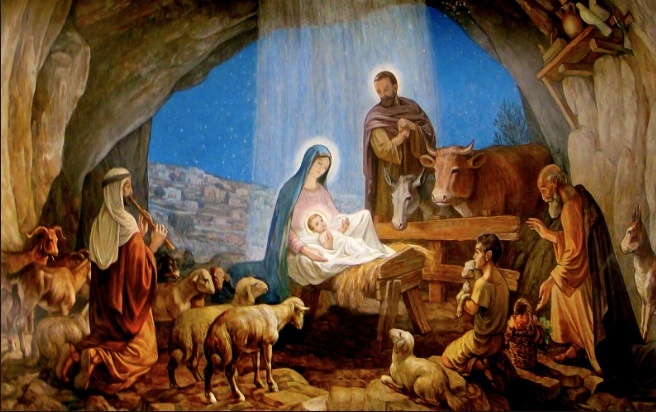 Since I was not present when the early church began to celebrate the holiday as the birthdate of our Lord, I cannot state 100% how it came about. There exists more than one version of this occurrence and quite frankly, I do not know what to believe. I have heard probably every defense and offense out there, hoping to be able to come to some valid conclusion. I never stopped celebrating Christmas with my family (biological and church) but pretty much out of the gate into my Faith the information on Christmas being a pagan celebration not about Jesus, was shared with me. This knowledge effected my desire to celebrate it soon thereafter. The other, more dramatic reason, is that I simply cannot stomach or support the consumerism that this holy day has been diminished to. I loved Christmas growing up and that is because it was about spending time with my family and all the delicious food we’d have as we celebrated together for several days. The gifts weren’t that important to me but I won’t say I didn’t get excited over what I may get. However, Jesus’s birth was not celebrated as the reason for Christmas in my immediate family. I didn’t know growing up that my grandfather (maternal) was technically a Jehovah’s Witness and they don’t even celebrate Christmas so this was my grandmother’s Christian upbringing influencing on him for certain. He loved Christmas just as much as the rest of us. I did, however, spend quite a bit of time at church around all the Christian holidays, up until I was a teenager. Therefore, I was very much aware of the meaning of the holiday. This included celebrating the Virgin birth and lifting my voice in song, worshipping and celebrating the Christ-child’s birth. Oh, how I loved singing those songs! And not just at church, I was in school choirs from 5th grade until well into college. Christmas music always held a warm place in my heart – even when I stopped “believing” in Jesus at age 14. And, that is where I circle back to my life and view of Christmas, as a Christian, over the past 9 years. I had a right attitude about it that first year – I recall cooking for days and inviting stray friends or whomever wanted to stop over, for Christmas Eve dinner and leftovers on Christmas day (I did the same thing at Thanksgiving). For me it was about serving others and spreading the newly discovered love that God has for me, with people who may have been in need themselves. I don’t recall exactly when my joy for Christmas began to fade but over the past 8 or so years, it has. My conundrum over the past 5 years was that I was heavily involved in church choirs, even being asked to sing solos at Christmas, and reconciling my new belief that we shouldn’t necessarily be putting on such pomp and circumstance with decorations and gifts, with celebrating the One who gives me life, every single day. It has been hard but I’ve sucked it up. What I have discovered, after much prayer and listening for God to help me understand what HE wants, is that back at the beginning of my Faith walk, I was influenced by the presence of a legalistic, religious spirit in a close mentor, including her religious attitude about Christmas. I’ve never gone as far a she had (turning her family against her because she refused to have a Christmas tree when they’d always had one) but I really lost the joy that celebrating Jesus’s birth should bring to me as His disciple. So, over the past couple of years when I’ve recognized any of that religious spirit rearing its ugly head, I’ve turned to my Lord and asked him to reveal the truth. He has helped me find that freedom in His love and grace I’m supposed to have, not the inability to enjoy Him as a religious spirit brings upon the ones who allow it to take root. I’ve been singing songs about the coming of the Christ-child with a few other ladies at my church, for the congregation, the past couple of weeks. It brings so much joy to my spirit to lift my voice to the heavenlies in celebration of my King! Today, as I sat and listened to the message delivered, I felt the veil of that religious spirit finally being torn. In fact, we end every service in individual prayer and at the end of that time, I had to rush to the ladies room because a flood of tears overcame me. I didn’t know why either…not until just before I sat to write this for you: It was a release from that religious spirit. I’m writing as one who, for ten years, didn’t allow my family to celebrate Christmas….I thought I was suffering persecution for my faith when relatives or friends criticized our colorless, joyless, loveless viewpoint about Christmas. Their criticisms actually hardened my heart and made me stand more firm. …Each December the children had to listen as I explained theologically why the Christmas tree was evil** and not celebrating Jesus’ birthday was good. Finally, with childlike innocence and purity, my oldest daughter, who was 9 at the time, asked why gift giving was evil if we were also honoring Jesus. Suddenly, my heart melted. I saw how religiously unloving this doctrine had made me. The message at my church today hit something in my heart about Christmas that I know is right about it: Jesus! It is about the gift of Jesus. It is about sharing Jesus. As Christian’s it is our responsibility to grab a hold of these holidays that celebrate our Lord and Savior, and keep them about celebrating Jesus in a way that honors and glorifies him. It is about His light illuminating the trees we may decorate. It is about the love He first had for us, therefore we then gift that love to others, whether it is in the form of a song, a prayer, a meal or a present. We give gifts because He was given gifts at his birth. Our style of celebration, not just at Christmas but at birthdays, mock what the Holy Bible tells us Jesus received at birth: honor, respect, and gifts that God led the magi to bestow upon the Christ-child. The best re-gift I’ve ever received, is the gift of my Redeemer. The best give I could ever re-gift is His love for humanity. That was the point of Jesus’ entire life: He was God’s Perfect gift to us. How could we deny celebrating Jesus Christ in a way he is worthy of…that of a KING! Thanks for this article, and for your vulnerability. I appreciated what you had to say about how the important part of Christmas is really all about Jesus, not consumerism–and how we can show others Jesus’ love in so many ways. I admire your disposition in explaining that things didn’t start off this way for you, and that things are coming around for your through prayer, and listening to God speak to you. That is so powerful and encouraging! I pray you would continue to hear God’s truth in your spirit, that you would continue to be encouraged during the holidays, and all the rest of the year, as you continue to serve others in the love of Christ, spreading to others what He has done for you. Reading that is so moving for me. Have a blessed week! Thank you so much for reading and taking time to comment, Lance! I appreciate your kind words and encouragement.